I finished socks for my husband after a considerable amount of math - finally achieving a pair that fits him after years of ill fitting hand made socks. I'm currently working on a pair of Coexist socks (pattern by Claire Ellen - available for Free on Ravelry) and, of course, continuing my work on my How To Eat An Elephant blanket. I show of some yarny acquisitions - all wonderful gifts, and have a general discussion of goals and upcoming projects for the New Year. What is Patreon? Patreon is an online membership platform that helps artists, like myself, get financial support from their fans. Patrons can elect to pledge monthly support (in very affordable small amounts) and receive special rewards for doing so. Rewards vary from level to level, but are always knitty in nature. Current rewards are listed on my page. Every level of patronage has a tangible reward! All funds collected through Patreon will go toward supporting the filming and publishing of the Knit Up & Dye Podcast, tools, equipment and products for demonstrations and giveaway prizes, as well as travel to knitting related events and classes to develop better knitting and dyeing techniques to be shared through the podcast, yarns and patterns. And, I have a bigger goal in mind. When I reach $500 per month, I’ll be able to offer exclusive online knitting classes to my patrons in which I’ll teach specific projects and all the techniques necessary to complete them. My dream is to be able to create a knitting class online that you can take from the privacy and comfort of your home, no matter where that may be. If you are interested in learning more, please take a moment to explore my page. This colorway scares me half to death every time I make it, only because it's one of those combinations that initially looks awful, but somehow magic happens and the colors become something so much more than the parts. "Gold Dust Woman" is exactly that... worth much more than the glittery powder she's made from. To make this sock blank, I utilize a couple of techniques. First I work controlled wall pours in my roasting pan with bright teal and orange dyes and carefully tilt the pans to allow these colors to swirl and bleed together. This bleeding together patinas the teal and tones down the vibrancy of the orange, turning it to a pretty copper. This copper always amazes me. I've never been able to replicate that color by any other method, and it is hard to control. Once I'm happy with the way the colors have blended (stopping short of making mud) I bake it off to heat set the dyes. The blank then gets a wash and spin dry before heading off to my airbrush table. I then airbrush in reds and navys to accent the southwest feel of these colors, whilst making use of the voids and adding some unexpected features to the piece. These processes worked together allow me to offer a blank richly saturated in color, with the whimsy of applied imagery. I'm currently addicted to this process and filling my shop with a bunch of one of a kind pieces. I'm VERY excited to announce I'm starting a Sock Blank Club! My first club will be three months long beginning in January, 2018. Each month you will receive a 100g/463 yard single knit sock blank of a unique design and colorway. Yup, that's right... each one will be a delightful surprise in your mail, with shipments posting by the 20th of each month. This club is VERY limited. If you are interested, don't wait. Purchase your membership today. Next club won't be until April, 2018. Free US Shipping on any order of $50.00 or more until January 5, 2018 - no coupon code required. Some colorway effects take longer to produce than others. 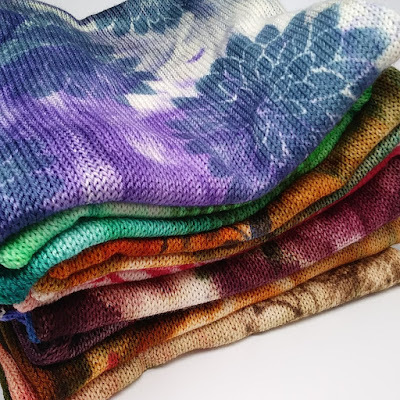 In this particular case, I knew I wanted to create a sock yarn with bright jewel tones but with a watery tonal effect, rather than fully saturated blocks of color. 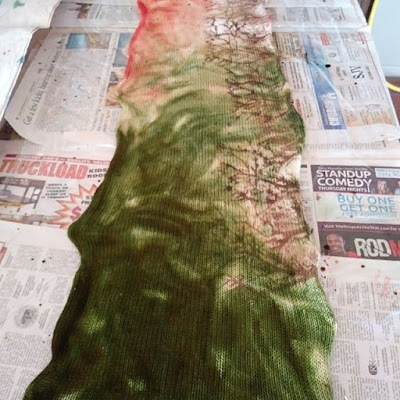 For this project, I opted to experiment in my roasting pans with a combination of poured and scribbled dyeing techniques. I soaked my yarns in a high acid solution in my roasting pans until fully saturated, then added a rich purple color to just one end and allowed it to set in the oven while I mixed up a medium sapphire blue and an emerald green and loaded those to condiment bottles for a scribble application. I applied these colors to the remaining white end, heat setting and then reapplying multiple times to achieve a layered and yet clean, not muddied look. I was careful to carry the scribble application of the dyes into the previously dyed purple to provide a cohesive blend to the overall skein, rather than leaving distinct color blocking. As I worked each application, I found myself waiting to see if it would muddy or retain the water color look I was hoping for. I am very happy with the end result. These skeins reminded me of the works of Claude Monet - his beautiful waterlilies and riparian representations, and thus I found with each batch, I had been "Waiting for Monet". Do you follow me on Instagram? If not, you should. You can find me there as dyemonkeyyarns. Today I'm dyeing sock blanks and posting pictures of them as I work, not only so that you can see the process that goes into them, but also to give you first chance to nab them for yourself. If you see a sock blank you love, simply direct message me through Instagram to claim yours! I'll have all the details in the post. Remember, each one is a One Of A Kind - so grab what you love while you can. I grew up in Maine, and even in southern Maine, on the rare occasion you can catch a faint glimpse of the dancing lights in the sky caused by colliding electrically charged particles entering the Earth's atmosphere over the north pole known as the Aurora Borealis, or Northern Lights. Now the faint displays are nothing like the vibrant pictures of this phenomenon you can find in your google search, but there were a couple of occasions that I remember being awe inspiring and even a little scary. What was this magic that caused what looked like blue fire in the sky? I'm older than google, so at that time, I didn't have the answer in the palm of my hand. "Northern Lights" is my interpretation of the aurora borealis. I intentionally used my Disco Monkey base in this colorway's creation due to its stellina content, which provides me a starry sky. I layer multiple blues, being sure to leave some white, silver and grey for the brightest of flashes. Knit up into socks, the colors chase each other around in a spiral, mimicking the swirling flashes of color I saw in the northern skies.